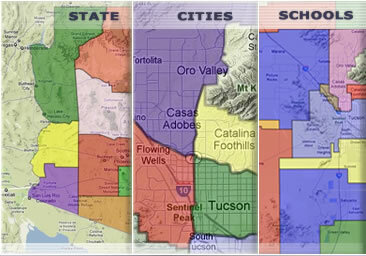 View Maps of all Counties throughout Arizona, all areas of the Tucson area, and all of the school districts in Tucson! View Tucson Real Estate Residential and Commercial Development maps. Search Tucson MLS by map and view detailed property reports including data on recently sold homes in Tucson. These are our interactive maps of Tucson Real Estate, Oro Valley Real Estate, Green Valley Real Estate, Vail Real Estate and Marana Real Estate Areas, which allows you to discover every active AZ MLS listings in that particular area as well as communities and properties recognized by their unique features.